The EVB90640-41 is an easy interface between the MLX90640 thermal infrared array and a PC. The evaluation board and its software enable the user to make temperature measurements, visualize and log them. 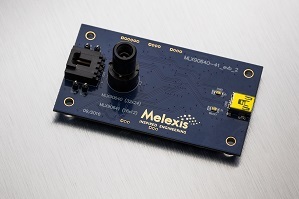 With the evaluation board the user can also reconfigure the MLX90640 for different applications by modifying several parameters such as the frame rate and some filter settings. Also the visualization is reconfigurable, for example the interpolation and the temperature color scale.